NOTE: If you cannot go back that far, then use the third ancestor, or even the second ancestor. 1) Me (born 1943) met my paternal grandmother Alma Bessie (Richmond) Seaver (1882-1962, once in 1959. 4) David Kirby (1740-1832) surely knew his paternal grandfather, Robert Kirby (1674-1757). 1) Me (born 1943) met my paternal grandmother Alma Bessie (Richmond) Seaver (1882-1962), once in 1959. 2) Alma Bessie Richmond (1882-1962) married Frederick Walton Seaver (1876-1942) in 1900, and surely met Frederick's grandfather, Isaac Seaver (1823-1901). 4) Susanna (Reed) Gates (1745-1833) surely knew her great-grandfather George Reed (1660-1756). 1) Me (born 1943) - my maternal great grandfather, Henry Austin Carringer held me when I was a baby. 4) Maria Dorothea (Dinkel) Spangler (1748-1835); Maria Dorothea (Dinkel) Spangler (1748-1835) probably met her grandfather, Johann Daniel Dunckel (1680-1753). 1) Me (born 1943) - was held by my great-grandmother, (1) Della (Smith) Carringer (1862-1944) (I don't remember it, of course!). 2) Della Smith (1862-1944, born in Wisconsin), daughter of Abigail Vaux (1844-1931), granddaughter of Mary Ann (Underhill) Vaux (1815-1883) may have met her great-grandfather, Amos Underhill (1772-1865, died in New York), but I doubt it! 4) John Underhill (1721-1793) (through mother Elizabeth (Ambrose) Underhill (1698-1782) and grandfather Nathaniel Ambrose (1677-1745)) met his great-grandfather, Henry Ambrose (1649-1724). So I can connect, with four degrees of separation, back to a man born in 1649 (but one of the links likely did not "meet" his great-grandchild) - over 360 years! For the requirement that they actually met, I can get back to a person born in 1660. I am in the 8th great-grandmothers and I'm up to Ancestor #1091 who is Alicia FENNE (1619-1710) [Note: the earlier great-grandmothers and 8th great-grandfathers have been covered in earlier posts]. 1090. Joseph Clarke, born before 11 April 1613 in Banham, Norfolk, England; died 06 January 1684 in Medfield, Norfolk, Massachusetts, United States. He was the son of 2180. Thomas Clarke and 2181. Mary Canne. He married 15 April 1640 in Banham, Norfolk, England. 1091. Alicia Fenne, born about 1619 in England; died 17 March 1710 in Medfield, Norfolk, Massachusetts, United States. * Joseph Clark, born 27 July 1642 in Dedham, Norfolk, Massachusetts, United States; died 04 September 1702 in Medfield, Norfolk, Massachusetts, United States; married Mary Allen 25 June 1663 in Medfield, Norfolk, Massachusetts, United States; born 11 December 1641 in Dedham, Norfolk, Massachusetts, United States; died 05 May 1702 in Medfield, Norfolk, Massachusetts, United States. * Benjamin Clark, born 09 February 1644 in Dedham, Norfolk, Massachusetts, United States; died 01 December 1724 in Medfield, Norfolk, Massachusetts, United States; married Dorcas Morse 19 November 1665 in Medfield, Norfolk, Massachusetts, United States; born 24 August 1645 in Dedham, Norfolk, Massachusetts, United States; died 14 July 1725 in Medfield, Norfolk, Massachusetts, United States. * Ephraim Clark, born 04 February 1646 in Dedham, Norfolk, Massachusetts, United States; died about 1699 in Medfield, Norfolk, Massachusetts, United States; married Mary Bullen 06 March 1669 in Medfield, Norfolk, Massachusetts, United States; born 20 July 1642 in Dedham, Norfolk, Massachusetts, United States; died 31 December 1726 in Medfield, Norfolk, Massachusetts, United States. * Daniel Clark, born 29 September 1647 in Dedham, Norfolk, Massachusetts, United States; died 07 April 1676 in Medfield, Norfolk, Massachusetts, United States. * Mary Clark, born 12 March 1649 in Dedham, Norfolk, Massachusetts, United States; died before 1732 in Medfield, Norfolk, Massachusetts, United States; married Jonathan Boyden 26 September 1673 in Medfield, Norfolk, Massachusetts, United States; born 20 February 1652 in Boston, Suffolk, Massachusetts, United States; died 30 May 1732 in Medfield, Norfolk, Massachusetts, United States. * Sarah Clark, born 20 February 1651 in Dedham, Norfolk, Massachusetts, United States; died 20 May 1704 in Medfield, Norfolk, Massachusetts, United States; married (1) John Bowers 07 January 1673 in Medfield, Norfolk, Massachusetts, United States; married (2) Samuel Smith 22 February 1677 in Medfield, Norfolk, Massachusetts, United States. * John Clark, born 28 October 1652 in Medfield, Norfolk, Massachusetts, United States; died 14 December 1720 in Medway, Norfolk, Massachusetts, United States; married Mary Sheffield 09 January 1680 in Medfield, Norfolk, Massachusetts, United States; born 14 January 1653 in Braintree, Norfolk, Massachusetts, United States; died in . * Nathaniel Clark, born 06 October 1658 in Medfield, Norfolk, Massachusetts, United States; died 11 July 1733 in Medfield, Norfolk, Massachusetts, United States; married Experience Hinsdale 26 March 1704 in Medfield, Norfolk, Massachusetts, United States; born July 1679 in Hatfield, Hampshire, Massachusetts, United States; died 03 February 1754 in Medfield, Norfolk, Massachusetts, United States. * Rebecca Clark, born 16 August 1660 in Medfield, Norfolk, Massachusetts, United States; died 17 February 1740 in Medfield, Norfolk, Massachusetts, United States; married John Richardson 01 May 1679 in Medfield, Norfolk, Massachusetts, United States; born about 1650 in Wells, York, Maine, United States; died 29 May 1697 in Medway, Norfolk, Massachusetts, United States. When my reader asked me in email ""I want to connect to A.J. 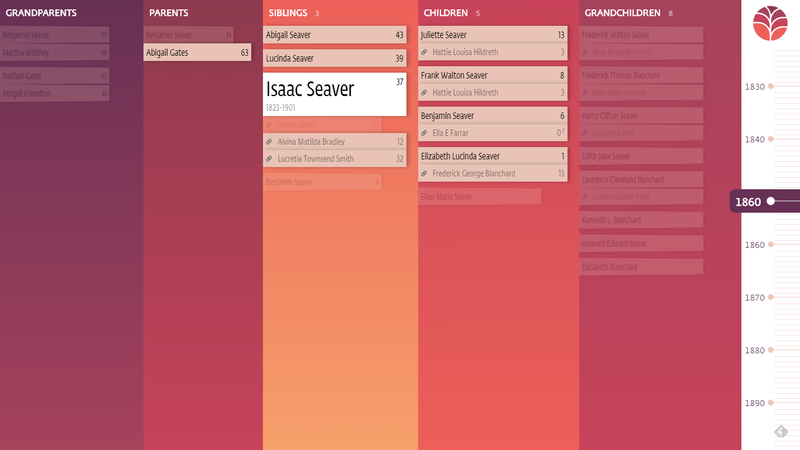 Jacobs and the Global Family Tree. How do I do this using Geni.com? ", I responded with an email that said "you also should consider using WikiTree, because it is a universal tree which is free to use and will accept a GEDCOM file." 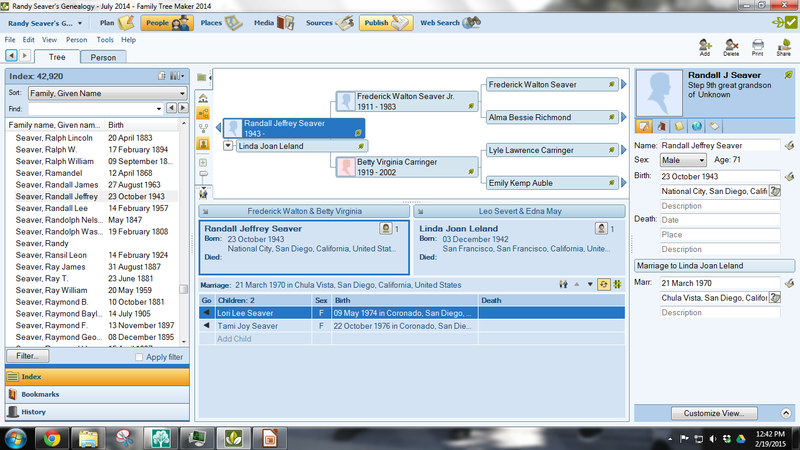 1) Create a GEDCOM file either by downloading an online family tree (e.g., from Ancestry.com) or in your genealogy software program (e.g., RootsMagic, Family Tree Maker, Reunion, etc.). 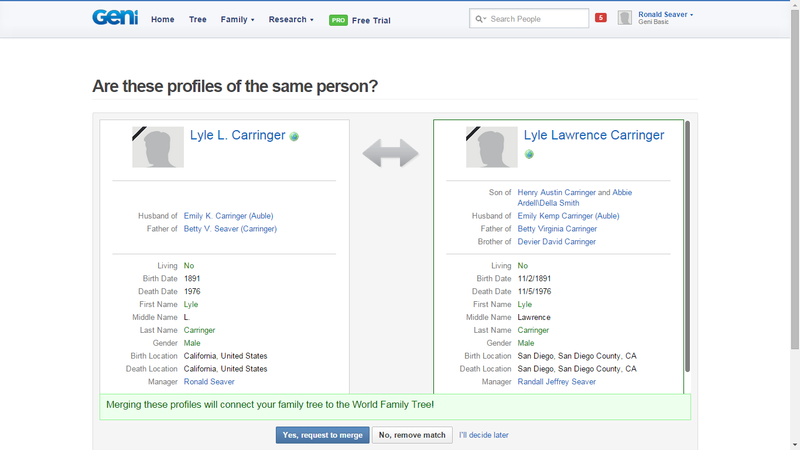 2) You should limit your GEDCOM file to about 2,000 persons because WikiTree prepares a GEDMatches report that compares your person profiles with profiles already in WikiTree. You will have to accept or reject all of the potential matches identified by WikiTree before your data can be added to WikiTree. There are guidelines for importing the GEDCOM in Before importing a GEDCOM. 3) Upload your GEDCOM file to WikiTree - see the Upload GEDCOM page for information. 4) That will generate your GEDMatches report, in which you will have to accept or reject all of the potential matches. After that is completed, then you can Import your profiles. There are guidelines for working on your GEDMatches. 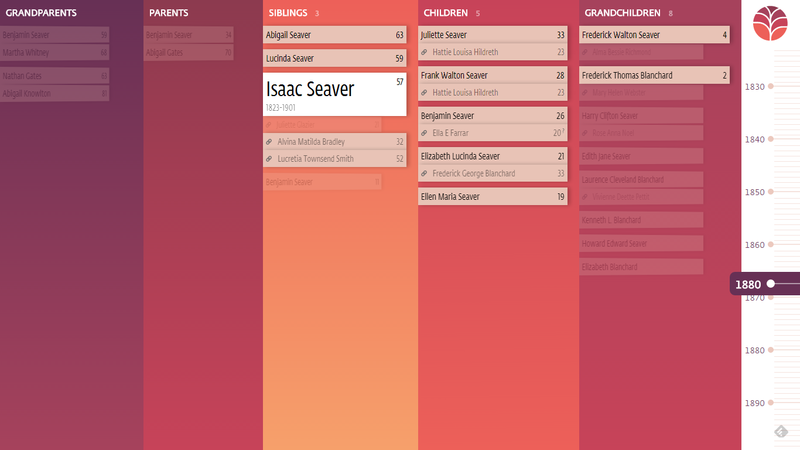 I described this matching process in Adding Early Seaver Generations to the WikiTree Shared Tree. It works well, but it takes some time to accomplish. 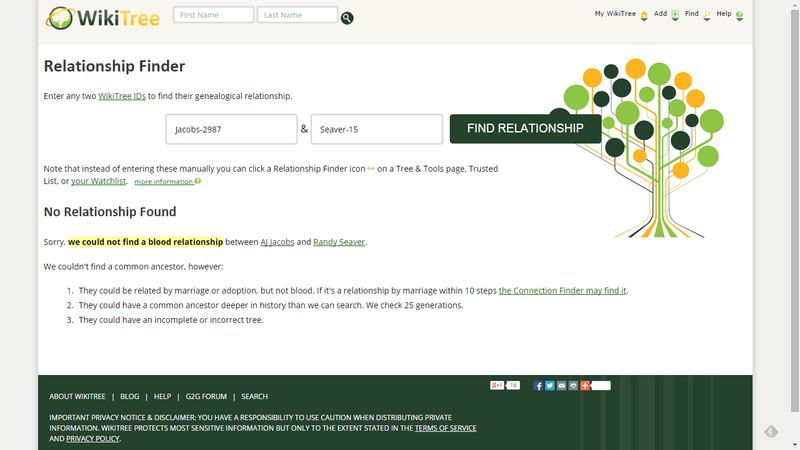 5) Then you can use the Relationship Calculator and find your relationship to A.J. Jacobs or other persons. You need to know your own WikiTree ID (mine is Seaver-15). I described this process in WikiTree's "100 Degrees of AJ" Tool and Relationship Calculator. So there are 24 degrees of separation, and the connection goes through A.J. 's mother's uncle's daughter's husband back in time to Abigail Whitney and her sister Martha Whitney (my ancestor). It says that "we could not find a blood relationship between AJ Jacobs and Randy Seaver." I knew that from before. 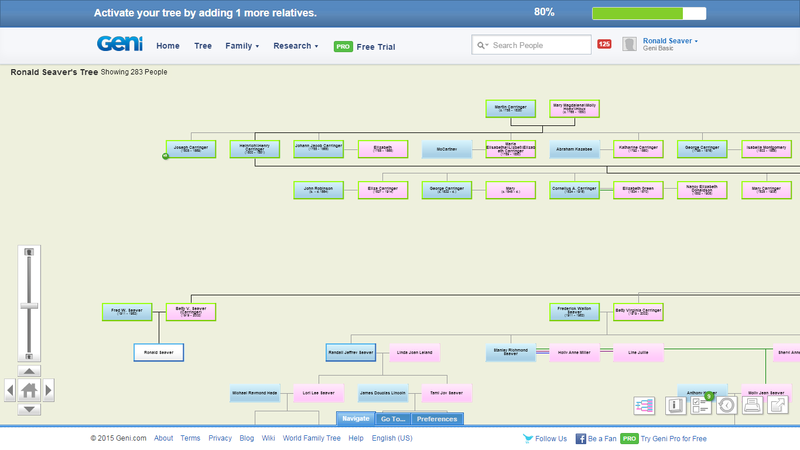 It does note that there may be a relationship by marriage or adoption, or a connection deeper in history than 25 generations, or AJ or I may have an incomplete tree. 7) Using WikiTree to find relationships to famous persons, including A.J. Jacobs, has several advantages over Geni.com, ,including that it is free to use and a GEDCOM file can be imported to WikiTree. The only real disadvantages is that the number of profiles on WikiTree is limited to about 10 million persons, and you cannot upload a large GEDCOM file. 8) Of course, the careful researcher will remember that WikiTree profiles are submitted by a number of researchers, and the names, vital records and relationships may be wrong, and that collaboration doesn't necessarily result in a better profile. 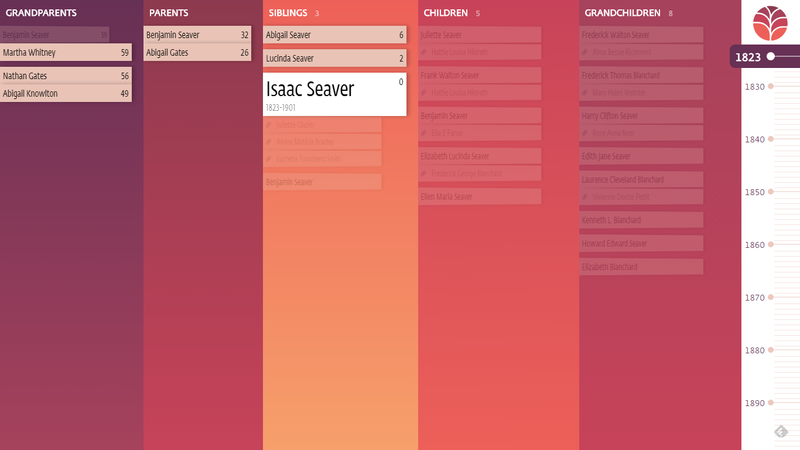 I took some time today to look over the RootsTech 2015 Innovator Challenge submissions page because I wondered if there were other submissions that might work with the FamilySearch Family Tree. 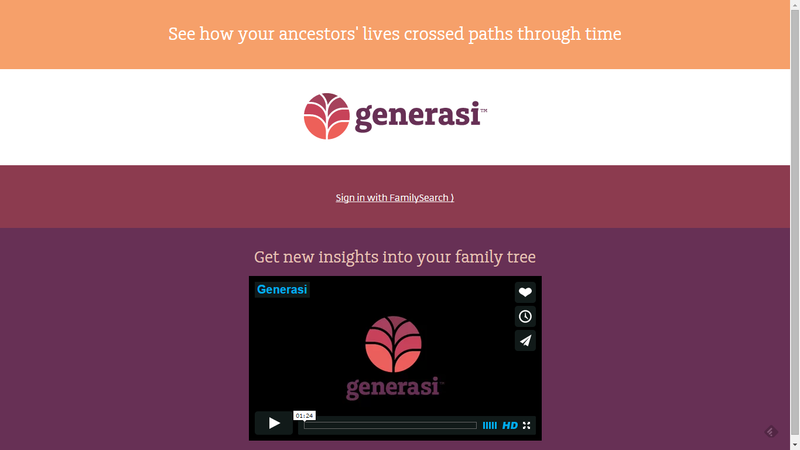 One suvmission that caught my eye was Generasi.me - a site that "replays the timeline of your ancestors' lives." I liked the color too (you know, a "bright shiny object" attracts my attention). 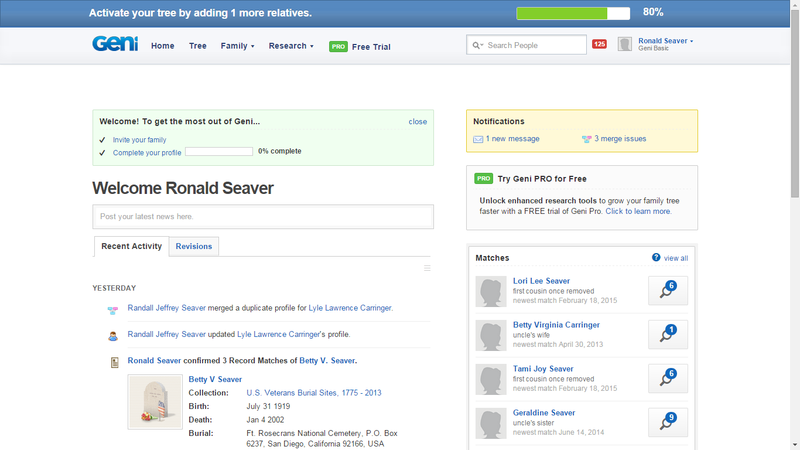 I watched the short submission video, and it looked pretty cool - it works with the FamilySearch Family Tree, and shows me which relatives of an ancestor are alive in a given year. 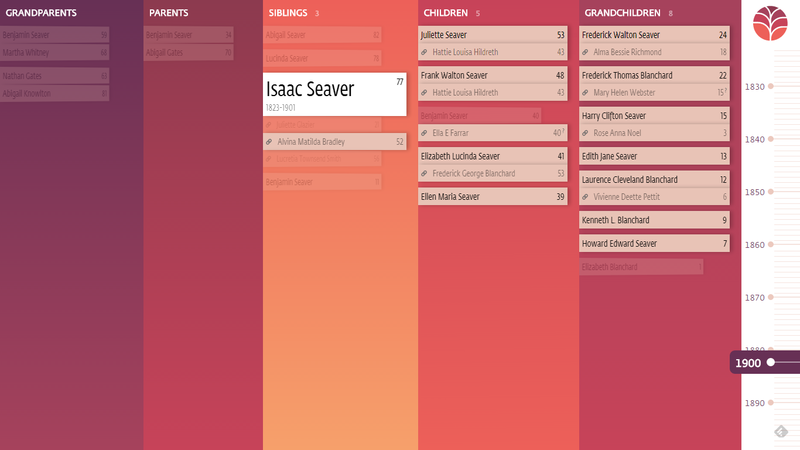 In 1823, three of Isaac's four grandparents, his two parents, and two siblings were alive (they are shown with a beige background, meaning they are alive), and it shows their ages. In 1860, his four grandparents have died, his mother is still alive, three of his siblings are alive, his first wife has died, and his other two wives are alive, and he has four children alive, but no grandchildren yet. 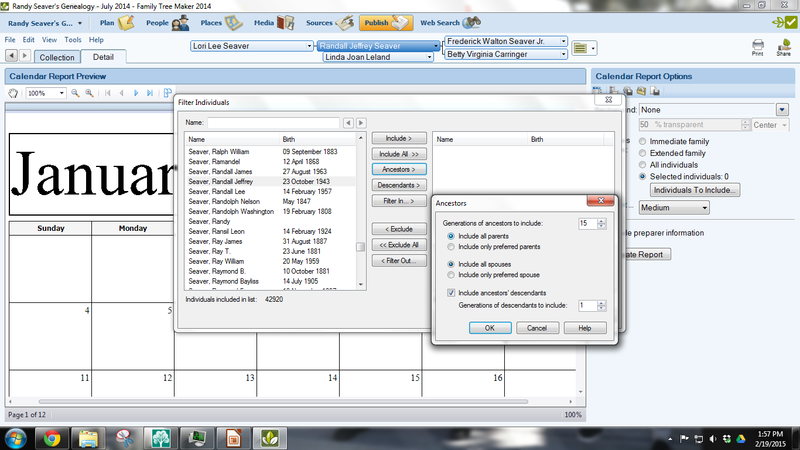 Of course, the presentation depends on accurate data for persons in the FamilySearch Family Tree. 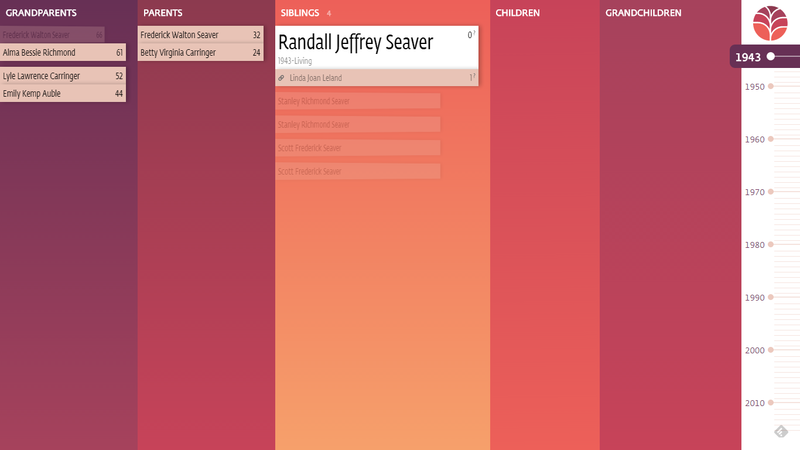 I like the concept - a user can quickly determine which family members are alive in a specific year. Generasi did not make the semi-final selections, perhaps because it worked with the FamilySearch Family Tree and has limited appeal for investors because there is no real opportunity to turn it into a profitable business. But it is a neat idea and a cool application! In Connecting to A.J. Jacobs on Geni.com - Post 1, I started a new Geni.com tree in an effort to see how difficult it is to find connections to A.J. Jacobs. "Thanks for your post on how to connect to A.J. Jacobs on Geni. Your post actually comes at a very interesting time. 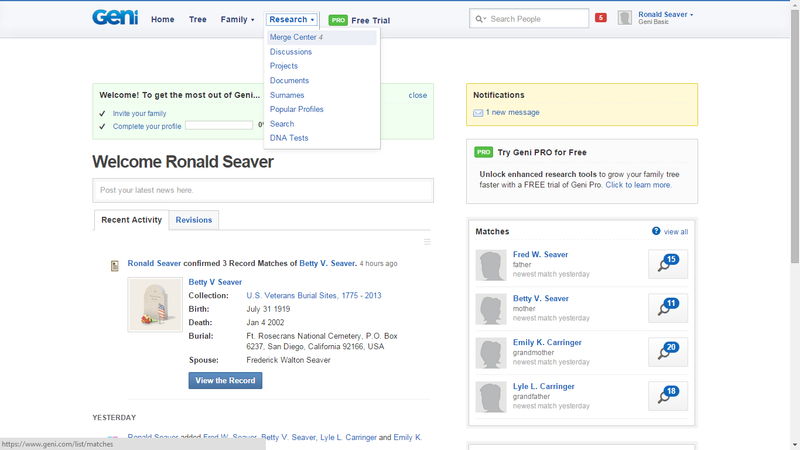 We've recently been working on making it free for users to view and request to merge any matches that will connect them into the World Family Tree. We've been doing this on a trial basis since early December, with trees that had such matches at that time. We're now extending that privilege to new trees as well. "As for the Tree Matches that failed to show up in your example, please allow me to clarify. All users are alerted when new Tree Matches are found. We have recently rewritten our process for finding and storing Geni Tree Matches and are in the process of refreshing matches across the entire system. Currently, matches are running a few days behind, but once we're done refreshing the entire Geni database, they should once again appear almost instantaneously. We have manually refreshed the matches in your test tree, which has now surfaced the matches on your grandparents. This, along with the newly-free matches, means you can now view and request the merges on your grandparents to join the World Family Tree. "Geni's collaborative community of users and Curators are constantly helping people get connect to the World Family Tree everyday. For those looking for more information on how to connect with AJ on Geni, we have set up a Global Family Reunion project (http://www.geni.com/projects/Global-Family-Reunion/17884). 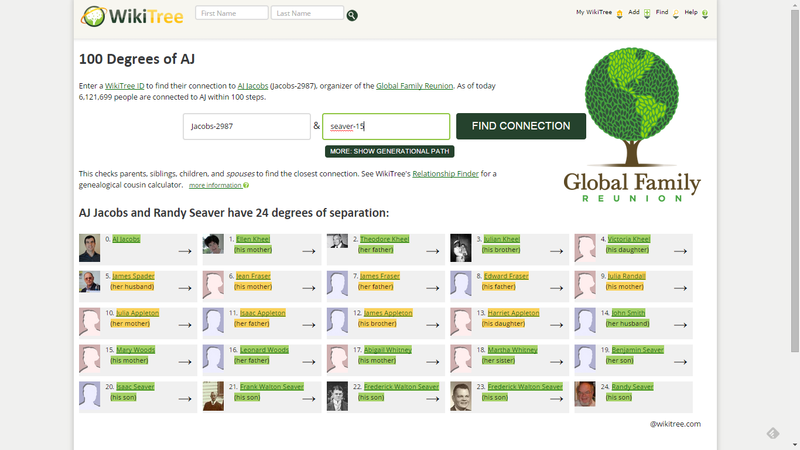 We also have a quick tool for users to discover their connection to AJ here http://www.geni.com/aj. " Subsequently, Amanda also offered that "all users can use the relationship calculator to see how they are related to others." That's great! Thank you to Amanda for the information, and for the "help" in refreshing he matches in my test tree. I clicked on the "Compare profiles" in the right-hand column, and was asked "Are these profiles the same person?" They are the same person, so I want to merge them. I clicked on the blue "Yes, request to merge" button at the bottom of the screen above. 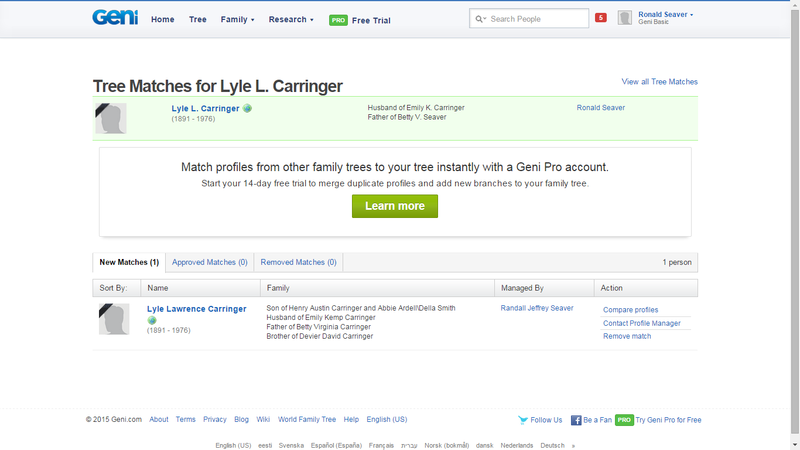 Last night, I logged into my "real" Geni.com Pro account and accepted the merge request, and merged my grandfather on that tree with my grandfather in the "test" tree. I could have merged my grandmother, mother and father also, but I haven't done that yet. However, because I did not request a merge with the other three persons on the Tree Match list, the tree is somewhat mixed up with two entries for my parents and my grandmother. I need to fix that! I should have requested a merge of all four when I had the chance. So it appears that, once duplicate profiles are found by the Geni.com matching system, a request to merge the duplicate profiles can be made to the profile owner, and once the merge is approved and consummated, the profile is merged and the Geni World Tree persons connected to that person appear on the person's tree. 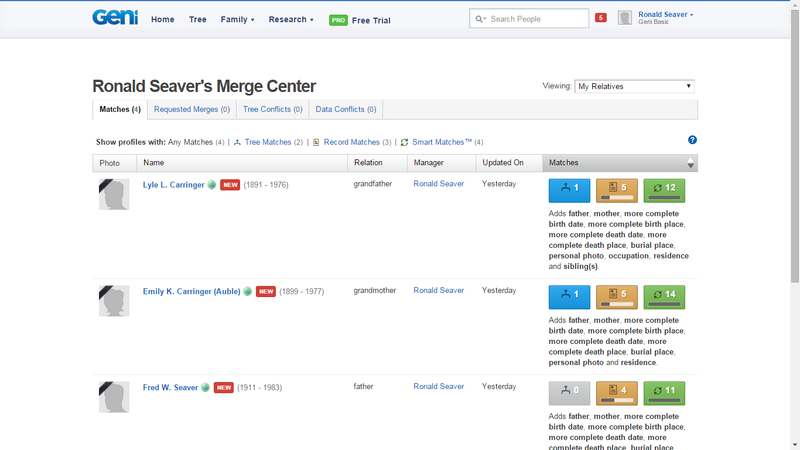 As noted in the first post, the user needs to add enough generations of ancestors so that the Geni matching system finds duplicate profiles, and then the requested and approved merge will add persons to the tree. The merge approval seems to rely on the profile owner, who may not respond immediately to a request. This is somewhat complicated, but it works. It would be easier if my "test" tree had a Pro account. Abigail (Knowlton) Gates (1774-1855) is #67 on my Ahnentafel list, my 4th great-grandmother. She married in 1790 to #66 Nathan Gates (1767-1830). * their daughter #33 Abigail Gates (1797-1867) who married #32 Benjamin Seaver (1791-1825), in 1817. "Abigail Knowlton daughter of Jeremiah Knowlton & Abigail Knowlton his wife was born the 21 day of January 1774." "KNOWLTON, Abigal, d. Jeremiah and Abigail, Jan. 21, 1774"
Her mother died in 1776. Jeremiah was a Revolutionary War soldier, and married Hannah Goffe on 9 September 1778 in Lincoln. He died in 1785 in Lincoln. Abigail's residence after the death of her mother is unknown - she may have been given a guardian (although I have found no record of one), or went to live with a relative of one of her parents. "Nathan Gates of Gardner and Abigail Knowlton of Westminster wear Entered May 9th 1790." "GATES, Nathan and Abigail Knowlton, June 17, 1790." 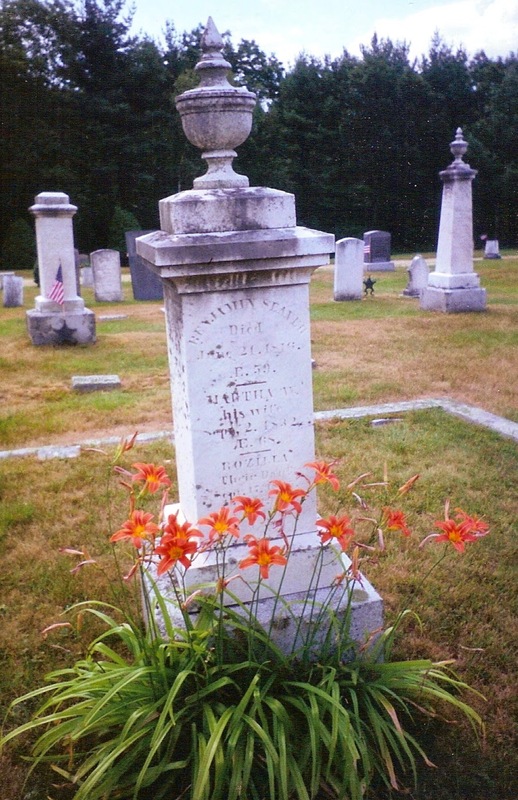 an infant girl Died Feb^r 12^th 1803 "
* Harriet Gates - age 16, female, born Massachusetts. Name Parents: Widow of Nathan Gates"
The age at death from this record calculates to 21 January 1772, which conflicts with the birth record in Lincoln of 21 January 1774. The most conclusive evidence that Abigail (Knowlton) Gates was the daughter of Jeremiah and Abigail (Pierce) Knowlton, born on 21 January 1774 in Lincoln, is that calculated birth date at death - 21 January. Apparently, Abigail married at age 16, and claimed 1772 as a birth year for all of her married life. The burial location of Abigail (Knowlton) Gates has not been found to date. 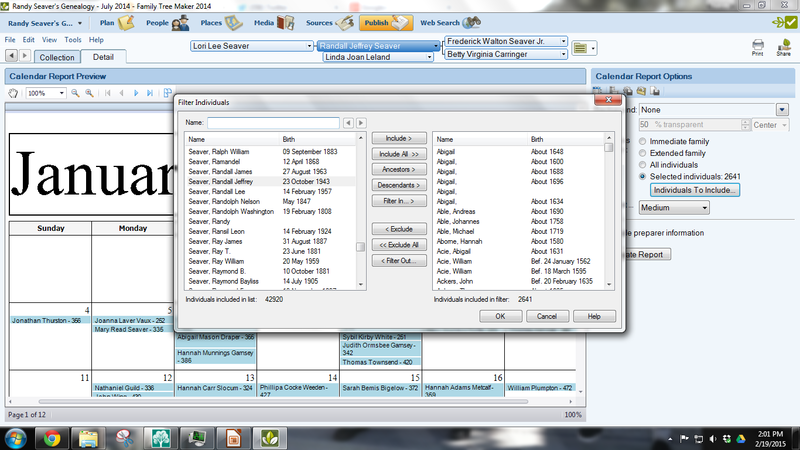 There are no probate records for Abigail (Knowlton) Gates in the Worcester County Probate Court records.
. Massachusetts, Town and Vital Records, 1620-1988, digital images, Ancestry.com (http://www.ancestry.com), "Lincoln Births, Marriages and Deaths," page 97 (penned) (image 226 of 1092), Abigail Knowlton entry.
. Massachusetts, Town Records, 1620-1988, digital images, Ancestry.com, "Gardner, Publishments," page 2 (image 2 of 45), Nathan Gates and Abigial Knowlton intentions.
. Massachusetts, Town Records, 1620-1988, digital images, Ancestry.com, "Westminster, Court Records, with Births, Marriages and Deaths," page 282 (penned, image 146 of 177), Nathan Gates and Abigail Knolton entry.
. Systematic History Fund, Vital Records of Westminster, Massachusetts, to the End of the Year 1849 (Worcester, Mass. : F.P. Rice, 1908), Marriages, page 142: Nathan Gates and Abigail Knowlton entry.
. Vital Records of Lincoln, Massachusetts, to the Year 1850 (Boston, Mass. : New England Historic Genealogical Society, 1908).
. Massachusetts, Town Records, 1620-1988, digital images, Ancestry.com, "Gardner Births, Marriages and Deaths," page 33 (stamped, image 26 of 779), Births and deaths of children of Nathan and Abigail Gates.
. 1850 United States Federal Census, Worcester County, Massachusetts, Westminster, Page 62B, Dwelling #243, Family #294, Asaph Gates household; digital image, Ancestry.com (http://www.ancestry.com), citing National Archives Microfilm Publication M432, Roll 340.
. "Massachusetts Vital Records, 1841-1915," indexed database and digital images, New England Historic Genealogical Society, American Ancestors (http://www.AmericanAncestors.org), Deaths: Volume 95, Page 117, Westminster, 1855; Abigail Gates entry. 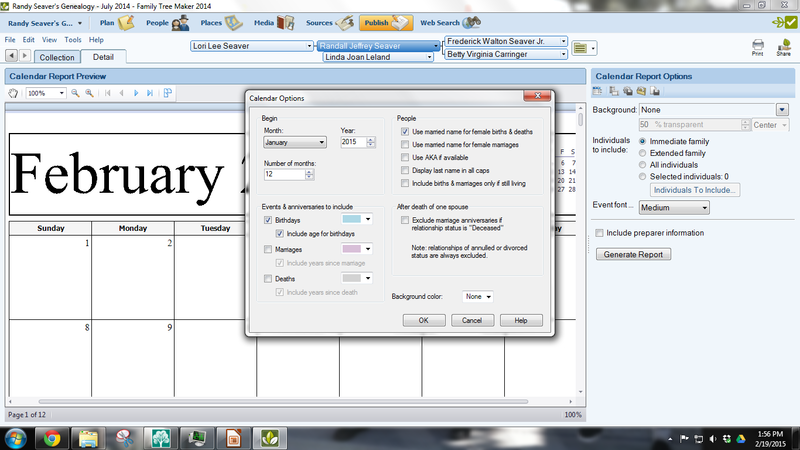 Dear Randy: How Can I Make a Calendar in Family Tree Maker 2014? My colleague Sondra sent me a Dear Randy note this morning, wanting to do the challenge in Saturday Night Genealogy Fun -- Your Ancestors or Cousins Born on Your Birth Date (posted 7 February 2015) using Family Tree Maker 2014. I selected "Selected Individuals" and the "Filter Individuals" screen opened. 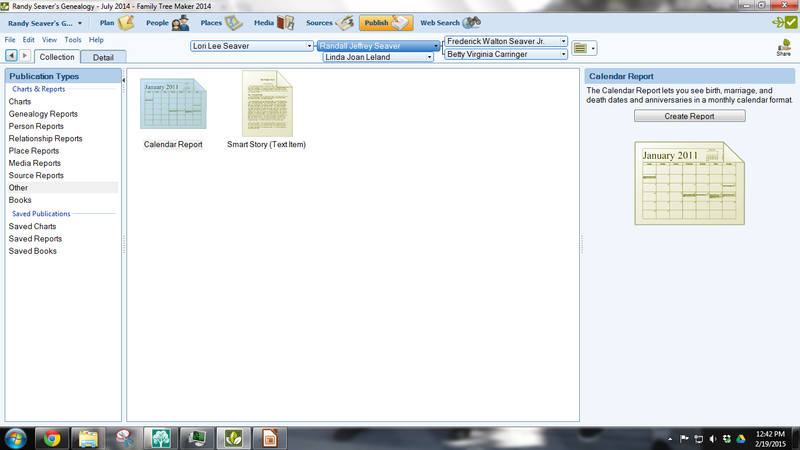 I wanted all of my Ancestors, so I clicked on the "Ancestors >" button and the "Ancestors" screen opened. I chose 15 generations of ancestors to include, "Include all parents" and "Include all spouses" plus "Include ancestors descendants" with 1 generation to get siblings of my ancestors. There were 2641 in my database. 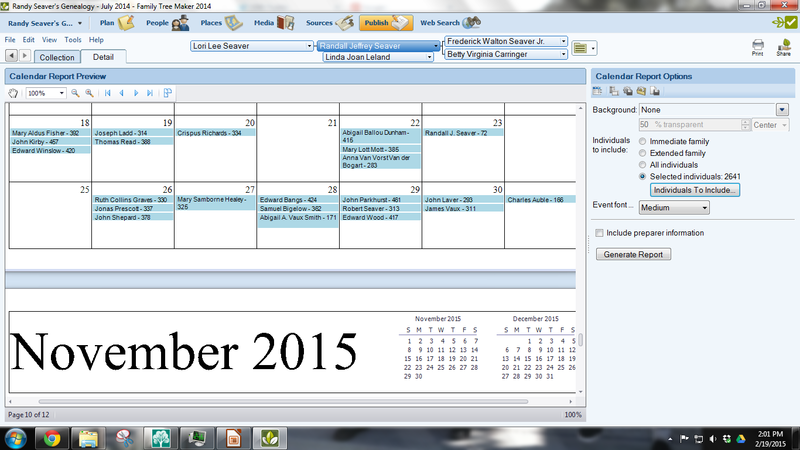 As you can see, none of my ancestors or their siblings have their birthday on my birthday, 23 October. I even found the cousin who has my birth date! 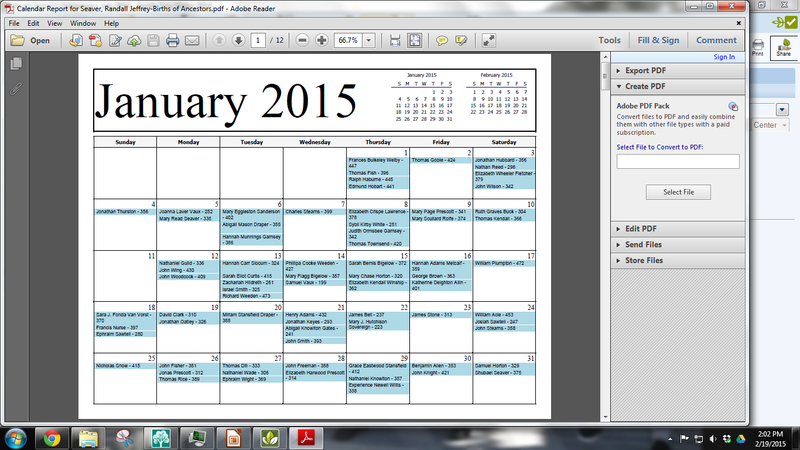 8) This works well, but you have to pay attention to the Calendar Options. 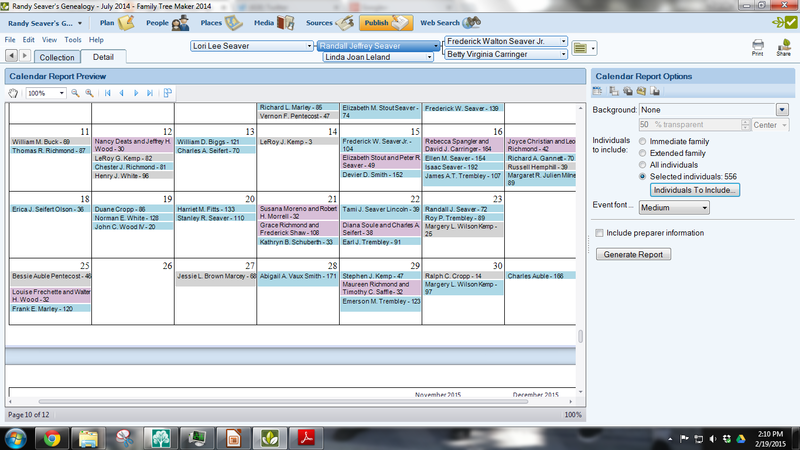 I had several false starts and using the Calendar Options made it all make sense. You also should do Births, Marriages and Deaths separately if you select a lot of persons. The Births and Deaths calendar date space lists only 5-7 persons, and the Marriages calendar date lists only 3 marriages, and they do it alphabetically.